Dry Pipe Sprinkler Systems are designed for applications where piping and sprinklers are subjected to freezing temperatures, such as unheated warehouses, parking garages, store windows, attic spaces, or loading docks. The sprinkler system contains gas instead of water. 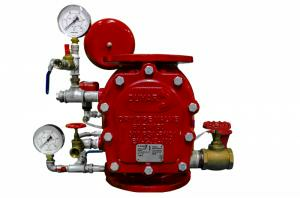 The dry pipe valve with special clapper keep the pressured water by low air pressure.In case of fire, sprinkler activated and the differantial of the system is broke down and ıt causes to open clapper. After the sprinkler activated by the fire the air in the sprinkler system is discharged from the sprinkler sysytem. The water is sent to location of the fire. By the time clapper opens the water also is sent to pressure switch and the switch send alarm information to fire warning system or automation system. After the switch is activated, the water is delivered to the water-motor gong and releases a mechanical alarm.